Citation: Molinaro, Angotti, Bindi, Pellegrino, Casini, Ravasse, Petit, Chiesa, Lisi, Leva, Riccipetitoni, Noviello, Cobellis, Martino, Casadio, Rossi, Bianchi, Messina, Sica. An European multicentric study of esophageal replacements: gastric pull-up, jejunal interposition, colonic interposition. J Histol Cell Biol 2018;1(2):31-4. The fundamental axiom of the esophageal surgery is that “the best esophagus is the native esophagus”, nonetheless there might be conditions (i.e. the Long-Gap Esophagel Atresia, LGEA) where the choice to preserve the native esophagus embeds several threats for the patient . As a consequence, the esophageal replacement (ER) becomes mandatory. There are many surgical techniques for such replacement, for example: the gastric pull-up (GPU), the gastric tube, the colonic interposition (CI) and the jejunal interposition (JI). However, there is a lack of general consensus regarding the surgery leading to the best results for the patient. Hence, this paper aims at providing a detailed overview of our results about different ERs, including CI, JI and the GPU. A retrospective multi-centric European study, coordinated by the Department of Pediatric Surgery of Siena, has been performed on a sample of 27 patients undertaking esophageal replacements (8 GPU, 9JI, 10 CI) from 1990 to 2015. The analysis carried out has considered cases of department of Paediatric Surgery CHU (Caen), Department of Paediatric Surgery of Parma, Ancona, Milano and Siena. The need for such replacements related either to Caustic Stenosis (CS) either to LGEA, where an immediate primary end-to-end anastomosis, owing to the distance between the proximal and distal esophageal remnant is usually not practicable. In structuring the analysis we have used the following parameters: mortality, postoperative complications, need for a second operation and the presence of dysphagia achievement of the 50º percentile of the height-weight curves as the last control of our group (subdivided by operation type). The presence of dysphagia was based on the revised Rome III diagnostic criteria. To confirm the soundness of our results we have performed the T Student test and the Fisher’s exact test, considering significant a P value<0.05. This technique have popularized by Spitz but it was first reported by Sweet at Mass General Hospital in Boston was firstly introduced by Spitz et al. was used [2-7]. The stomach is mobilized through a transverse laparotomy. The right gastric artery is identified and preserved, whereas the left gastric artery is divided close to the stomach. Then, the distal esophagus is dissected and the stomach is mobilised via a posterior mediastinal tunnel into the neck. An esophagogastric anastomosis is done at the apex of the stomach. Many surgeons performed a pyloromyotomy. The technique was introduced was used [9-11]. A control of the bowel and the vascular anatomy is performed from a median laparotomy. The fundus is separated from the diaphragm and the short vessels are severed. The posterior hiatus is opened after the mobilization of the left crus. After the pedicle graft is created: the segment of jejunum close to the Treitz is selected. The first two mesenterical arteries are divided to preserve the peripheral vascularisation. The jejunum is then skeletonized upwards leaving the uppermost part in place for interposition. The anastomosis to restore the bowel continuity is performed and then the graft is mobilised into the neck through the posterior hiatus. Finally, the anastomosis between upper esophagus and jejunum and between jejunum and stomach are made. Our sample included 27 patients: 10 females and 17 males (respectively 37% and 63%). In 19 patients the ER was due to LGEA, while for the remaining 8 it was caused by a CS. Before the operation, patients with LGEA undertook an upper gastro-intestinal X-Ray with barium, whereas patients affected by CS had an upper gastro-intestinal X-Ray (Figure 1) with barium and an endoscopy. Patients have been additionally subdivided in three groups: 8 for GPU, 9 for JI and 10 for CI (29.7%; 33.3%; 37%). Figure 1: Post-operative upper gastro-intestinal X-Ray of GPU. All GPUs were done by a posterior mediastinal route and an additional thoracic incision was done in 3 cases. All the 9 JI patients required a single stage operation with an isoperistaltic graft by a posterior mediastinl way. The CI patients needed an isoperistaltic graft by a posterior mediastinal way. 23 patients (85.2%) required a pyloromyotomy. At the end of the surgery, 8 patients got a gastrostomy and 5 received a jejunostomy. On average, we have observed different ages between the two groups based on the indications to the surgery (ERs due to LGEA and to CS). Precisely, 17.3 months (0.1-72 m) for the first and 80 months (12-192 m) for the second one. We used a nasogastric tube and a drainage chest tube for all those patients ranging between 7 and 9 days after the surgery. They have started feeding after 7 or 8 days from the operation and all of them undertook an antacid therapy. After the surgery, 17 patients (63%) showed complications, out of which 10 (37%) were early complications and 7 (25.9%) were late complications (Table 1). Table 1: Patients’ surgery complication, *we have considered only the occlusive syndrome that has treated with another surgery. Results have been divided by operation: 9 complications for CI (33.3%), 4 for JI (14.8%) and 4 for GPU (14.8%). We have analysed these differences using the T Student distribution test without finding statistically significant differences (CI p=0.173; JI p=0.4007; GPU p=0.5909). In our study, we have not considered reflux and redundancy as complications since not all the patients undertook an endoscopy or a pH-metre after the surgery and the redundancy was not always symptomatic. During our study, only 1 patient died; she belonged to the CI group due to an anastomotic leakage complicated by a mediastinitis after 14 days from the surgery. The observed mortality accounted for 3.7%, hence not representing a statistically significant difference (p=1.000). Such mortality value regarding the CI (10%), higher than the one observed in Literature was due to the sample relatively small dimensions . An additional surgery has been required in 3 (11.1%) patients, all of these belong to the CI group. In two cases the second surgery was due to an occlusive syndrome, in one patient the conduit had necrosis. The comparison between techniques had no statistically significant differences (CI/GPU p=0.2157, CI/JI p=0.2105). The 72.1 months follow up regarded 23 patients (1 patient died and we lost 3 patients after the discharge). It has lasted for long than 5 years, the maximum required delay to register a significant improvement in the quality of life . In the last follow up only 23 patients (85.2%) did not show problems in feeding and only 14.8% of them presented dysphagia (we supposed that 1 patient was affected by a münchhausen syndrome). Only the JI group lacked patients with dysphagia (2CI, 2GPU) (Figure 2). Although some differences between these groups have arisen, they were not statistically significant (CI/JI p=0737; CI/GPU p=1000; JI/GPU p=0157). 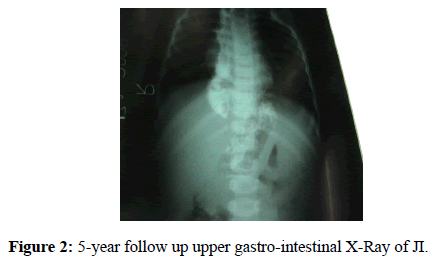 Figure 2: 5-year follow up upper gastro-intestinal X-Ray of JI. All patients have increased their weight during the follow up, out of which 17 fell within the 50° percentile of the heightweight curves (5 for GPU, 5 for CI and 7 for JI), 9 in the 3° and only 1 below the 3°. We have considered the 50° percentile as a benchmark for a good improvement in height and weight, and even in this case the observed differences were not statistically significant (CI p=0.3029; GPU p=0.9754; JI p=0.2771) (Table 2). Table 2: Summary of our results, * the percentages are considered on the totality of patients. For the purpose of our study, it is worth mentioning that conserving the native esophagus is not always the best option and the ER might become mandatory. Nevertheless, the best replacement technique still needs to be found. Our retrospective analysis has allowed us to compare three technical surgeries for the ERs, with a particular focus on surgery complications and the patients’ follow up. All the surgeries taken into account have been done by one-step even if sometimes surgeons prefer two-steps surgeries [14,15]. The leakage and the stenosis of the anastomosis are the most analysed by the Literature. Throughout the study we have described 2 leakages of anastomosis, treated without a second surgery and 1 stenosis of anastomosis. The GPU usually has many advantages, such as the need for a single anastomosis on the gastric fundus with a low rate of leakage and stenosis, a good vascular supply and a good length of the graft. Moreover, there is a low risk of conduit's necrosis. On the other hand, disadvantages include the reflux and the reduction of the mediastinal space as a consequence of the graft size. On the other hand, disadvantages include the reflux and the reduction of the mediastinal space as a consequence of the graft size. The analysis of the GPU group has shown that this specific technique might be a good way to create the new esophagus . Moreover, it is easy to implement presenting a low complication rate as well, both during and after the surgery. Insights suggested that follow ups have lasted on average 5 years, providing evidences that patients have steadily improved their height and weight, feeding properly after the surgery. As regards the JI, the advantages relate to the fact that it is the most similar esophagus substitute due to the maintenance of the peristalsis  and to the right size of the graft. However, it leads to both, a poor vascularisation of the conduit and the difficulty to create a cervical anastomosis without tension. For the last reason the JI seems to have a higher rate of anastomotic complications . The analysis of the JI group has highlighted a lack of complications during the surgery. In addition, our patients have not been affected by the conduit necrosis, the major complication for this particular surgery. These patients’ follow up has accounted for, on average, 7.3 years, without difficulties in feeding. As a matter of fact, 7 of them have reached the 50° percentile of the height-weight curves. As far as the CI is concerned, the advantages are: the optimal vascularisation and the proper size of the graft. Instead, the disadvantages are: the risk of the conduit ulceration caused by the reflux, the redundancy, the need for three anastomosis and the growth retardation [19,20]. The CI group showed the highest complication rate, including the conduit necrosis as well. Here, we have observed a standalone case of mortality. In addition, during the follow up 5 patients have achieved the 50° percentile of the height-weight curves. Despite its complication rate, the CI is the most widespread technique [15-20]. Our study has provided evidences that the best substitute for an esophagus is likely to be the native one and among the possible substitutes there is not a widespread best practice. In our opinion, all the surgeries evaluated in this study might be the “best choice” for the patient. Therefore, the surgeon’s preferences and abilities become the main drivers when discriminating among different alternatives. Such thesis is confirmed by the lack of statistically significant differences between the GPU, the CI and the JI. However, our results have shown that the JI had a low rate of complications and mortality; this group did not need a second surgery and during the follow up no one has been affected by dysphagia. Moreover, this group presented the higher rate of patients achieving the 50° centile of the height-weight curves. According to these clinical results, we believe that the JI should be the first choice for this surgery in the future. Rudler JC, Monod-Broca P. “Un cas d’esophagoplastie palliative retro-sternale avec d’ileocolon droit”. Mem Acad Chir. 1951;77:747. Spitz L. Gastric transposition for esophageal substitution in children. J Pediatr Surg. 1992;27:252-7. Spitz L. Gastric transposition via the mediastinal route for infants with long-gap esophageal atresia. J pediatr Surg. 1984;19:149-54. Spitz L, Kiely E, Sparnon T. Gastric transposition for esophageal replacement in children. Ann Surg. 1987;206: 69-73. Spitz L. Gastric transposition for oesophageal replacement. Pediatr Surg In. 1996;11:218-20. Spitz L, Kiely E, Pierro A. Gastric transposition in children-a 21 year experience. J Pediatr Surg. 2004;39: 276-81. Spitz L. Gastric transposition in children. Semin Pediatr Surg. 2009;18:30-33. Hamza AF. Colonic interposition in cases of esophageal atresia. Semin Pediatr Surg. 2009;18:40-43. Bax NMA, Rövekamp MH, Gunne AJPT. Early one-stage orthotopic jejunal pedicle-graft interposition in long-gap esophageal atresia. Pediatr Surg Int. 1994;9:483-85. Bax NMA, Zee DCVD. Jejunal pedicle graft for reconstruction of the esophagus in children. J Pediatr Surg. 2007;42:363-9. Bax NMA. Jejunal for bridging long-gap esophageal atresia. Semiin Pediatr Surg. 2009;18: 34-9. Lima M, Destro F, Cantone N, et al. Long-term follow-up after esophageal replacement in children: 45-Year single-center experience. J Pediatr Surg. 2015;1457-61. Cerchia E, Molinaro F, Pavone M, et al. Esophageal atresia with distal tracheoesophageal fistula: surgery treatment and a long term follow up. J Siena Acd Sci. 2012;4:30-4. Ein SH, Spitz L, Coran AC. Rob & Smith’s Operative Surgery: Pediatric Surgery. 1995;143-51. Ergun O, Celik A, Mutaf O. Two-stage coloesophagoplasty in children with caustic burns of the esophagus: hemodynamic basis of delayed cervical anastomosis: theory and fact. J Pediatr Surg. 2004;4:545-48. Angotti R, Molinaro F, Noviello C, et al. Gastric transposition as a valid surgical option for esohageal replacement in pediatric patients: experience from three Italian medical centers. Gastroenterol Rep. 2016;1: 5. Cauchi JA, Buick RG, Gornall P, et al. Oesophageal substitution with free and pedicle jejunum: short and long-term outcomes. Pediatr Surg Int. 2007;1:11-9. Gallo G, Zwaveling S, Bax KN, et al. A two-center comparative study of gastric pull-up and jejunal interposition for long gap esophageal atresia. J Pediatr Surg. 50:535-39. Arul GS, Parikh D. Oesophageal replacement in children. Ann R Coll Surg Engl. 2008;90:7-12. Othersen BH, Smith CD, Tagge EP. Esophageal replacement with colon in L. Spitz, A.C. Coran (Edn) “Rob & Smith’s Operative Surgery: Pediatric Surgery” V edizione, Chapman & Hall Medical. 1995;136-42.